The document, signed by one D.F.P. De Mel, sets out what people should and should not do as per ‘The Royal Etiquette Ordinance,’ explaining that although full independence was obtained in 1972, certain laws were not changed to suit the new circumstances and therefore still hold. The truth is that there is no such Ordinance. Even if one were not an expert on constitutional matters, the said guidelines themselves indicate that the document is a hoax. For example, it states that mobile phones should be switched off at all times. A dead giveaway, that. Perhaps it is because the rest of the guidelines seem plausible enough that the document has had so much carry, especially in social media where it has gone viral. The impact can be ascertained by the fact that the High Commission and the Ministry had to come out and rubbish the document. On the other hand, one might argue that it was something more than the plausibility that is at work here. One might say, for example, that it is the behavior of the current regime that has buttressed the believability factor. In short, the deference and even servility shown by the regime to the West and to Royalty in particular give credence to what is a clever and yet carelessly crafted spoof. Let’s begin with Ranil Wickremesinghe. When he was briefly the Prime Minister of the country in the early days of this millennium, Wickremesinghe planned to celebrate the 500th anniversary of the Portuguese arrival on the shores of this island. Celebrate? Yes, ‘celebrate’. Now only someone who has internalized oppression to the point of celebrating his or her condition could think of something like that. That’s Ranil Wickremesinghe. How about Maithripala Sirisena? Well, he’s the man who went ga-ga when he visited England. He bragged about going to Downing Street. He bragged that the Queen offered him her hand (I mean, to ‘shake’), after removing the glove, no less! To be thrilled enough to think that diplomatic protocol is ‘acceptance,’ is the true mark of a servile ‘native’. 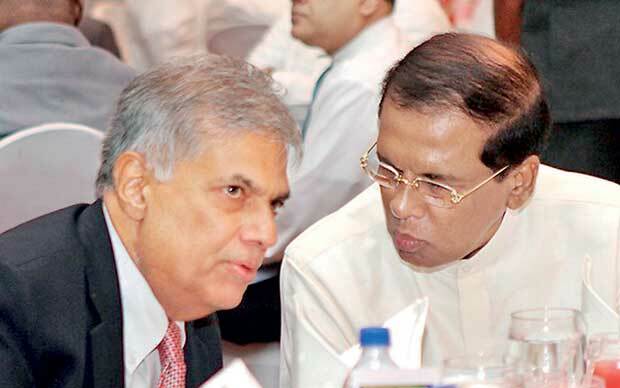 The only difference is that Maithripala is a redda-baniyama vassal whereas Wickremesinghe is a tie-coat slave. Either way, it makes perfect sense for them to fete Royalty. So, yes, the High Commission and the Ministry are correct; it is a false document. There is no such thing as a ‘Royal Etiquette Guidelines’ and there’s no ‘Welcome Committee of British Royals.’ Not on paper, certainly. But no, they are wrong. There IS a ‘Welcome Committee of British Royals.’ It is a two-man committee made of President Maithripala Sirisena and Prime Minister Ranil Wickremesinghe. There IS a set of guidelines pertaining to ‘Royal Etiquette’ but it is wider and far more pernicious than the one signed by someone who calls him/herself D.L.F. De Mel. Those guidelines are followed to the letter by these two. Note what they have done and what they do and you’ll obtain the guidelines they follow. The High Commission and the Ministry of Foreign Affairs may have said ‘No, there’s no Welcome Committee of British Royals’ but the Prime Minister and President are emphatically countering this claim. Yes, there is a ‘Welcome Committee of British Royals,’ and there is a Guideline for Royal Etiquette. Ranil Wickremesinghe and Maithripala Sirisena provide living proof of both. Edward has already left or will be leaving soon. We got millions of Indian Colonial Parasites who arrived under the cover of the British. They decide the fate of us Sinhalese. These Indian Colonial Parasites are still in the Indian Colonies from Fiji to Guyana, the Indian Empire the sun never sets. The Indian puppet Sirisena did not see the difference between 70 and 30. Uva Wellassa Sinhala uprising was put down by the British and Indians. It is the Indian Sepoys who helped the British as they did in elsewhere. Mohandas Karamchand (Mahathma Gandhi) was a Sepoy who helped British put down the Zulu uprising. Don’t forget 2013 CHOGM carnival and PRINCE CHARLES!! We do have short memories. ALL presidents invited royals. Some accepted some didn’t.